Eggless Mango Cake without using condensed Milk, with flavors of fresh mango pulp is the ultimate mango dessert recipe. Perfect for the summer season! So, summer season has started. And this calls for easy to make summer desserts/summer recipes. One of the very first summer desserts , I am gonna share here on the blog, is this easy to make, moist and full of fresh flavors – Eggless Mango Cake. If you are hearing this term ‘Mango Cake’ for the first time, don’t worry, you are not the only one. Few years back even I didn’t know that something called ‘Mango Cake’ exists or that we can use a mango in a cake recipe. But I tried this cake and it came out so well. It tasted so good. The best thing about this recipe is that it’s a 1 BOWL CAKE RECIPE. So, what’s a 1 bowl cake recipe? A one-bowl cake recipe means we only need one bowl and a spoon (or a hand mixer) for making this cake. We simply add all the ingredients, one by one, into the bowl and mix till a nice and smooth batter is formed. 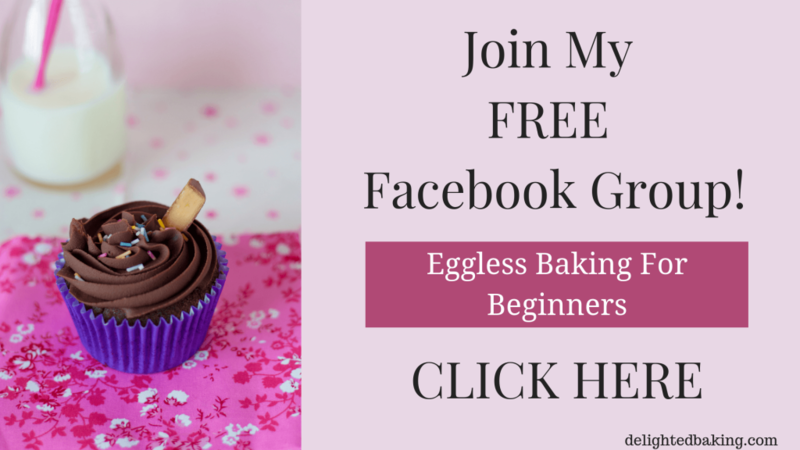 This is one of the easiest methods of making a cake. Mostly eggless cake recipes use condensed milk (as a replacement of eggs) but I didn’t use condensed milk in this recipe. And even without condensed milk (or egg) , this cake is moist and soft. This is an easy mango cake recipe. It doesn’t need any fancy ingredient. Most probably you will have all the ingredients at home. How to make the best mango cake? As this recipe is a fresh mango cake/mango pulp cake recipe, we will first make mango puree for the recipe. For this, simply peel the mangoes, roughly chop them, add them into a blender jar and puree them. For this recipe, you don’t need a hand mixer or a stand mixer. You can simply use a hand whisk or even a simple spatula. Just remember, don’t over mix the cake better as that can lead to a tight and dense cake. As I said earlier, this recipe requires only a handful of ingredients. And all it takes is an hour to prepare and bake. And that’s the best thing about this recipe. If you want to make mango cupcake/muffins, you can use this exact recipe. Make the cake batter as given in the instructions. Instead of baking in a loaf pan/round pan, add the cake batter into muffin moulds. Remember – Fill the muffin mould only till 3/4th part otherwise, the batter may spill out while baking. The temperature for baking mango cupcakes/muffins will be the same, you just need to reduce the time. Bake the mango cake at 180C/350F for 30-35 minutes or till a toothpick inserted into the centre of the cake comes out clean. On the other hand, bake the mango cupcakes/muffins at 180C/350F (SAME TEMPERATURE) for 12-15 minutes or till a toothpick inserted into the centre of the cupcake/muffin comes out clean. So here you have one recipe that you can make in two different forms. One more thing, before we head on to the recipe – I have added a few tutti frutti in this recipe. You can avoid these if you don’t like their taste. 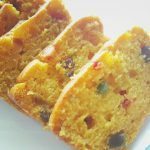 Eggless Mango cake is an easy to make loaf cake. Perfect Summer Cake for tea time. This cake is made using fresh mango pulp. Preheat the oven to 180 degree centigrade. Grease a loaf tin with oil. Dust some flour. Keep it aside for a while. In a bowl, add oil and sugar. Mix till the sugar melts. Now add the mango puree. For making mango puree, simply chop a mango and puree it in a mixer. For 3/4 Cup of mango puree, you will need around one and a half mango. After this, add flour, baking powder and baking soda. Mix properly till this forms a smooth batter. Pour the cake batter into the loaf tin. Bake at 180 degree centigrade for around 30-35 minutes. I hope you try this recipe and that you like it! If you have any questions regarding this recipe, feel free to ask them in the comments below. 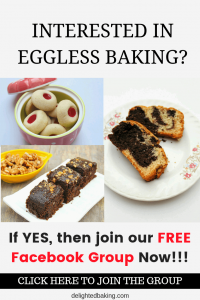 Do try other eggless cake recipes on the blog.